The barbell bent over row is a back exercise that can also be performed using dumbbells or bands. By supporting the weight in the bent over position it works the core muscles as well as the back and biceps. It is an exercise that can be utilized in workouts for almost any specific goal. To perform this lift load up a barbell with your desired weight. 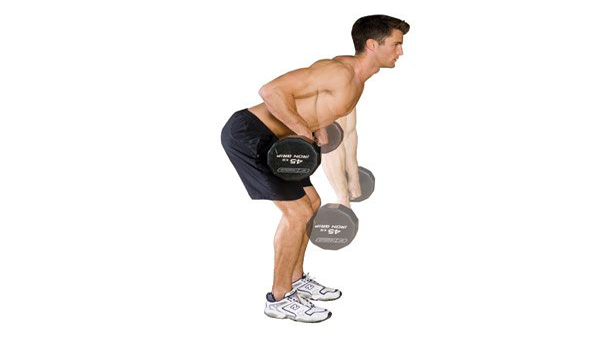 When picking it up off of the floor use your legs, similar to a dead lift. Your back should bent over almost parallel with the floor. While keeping your back straight and tight pull the bar directly to your belly button. Squeeze your shoulder blades together to make sure you are getting the proper contraction. Release the weight back down slowly and under control. Your bodyweight should be shifted to your heels throughout the lift.